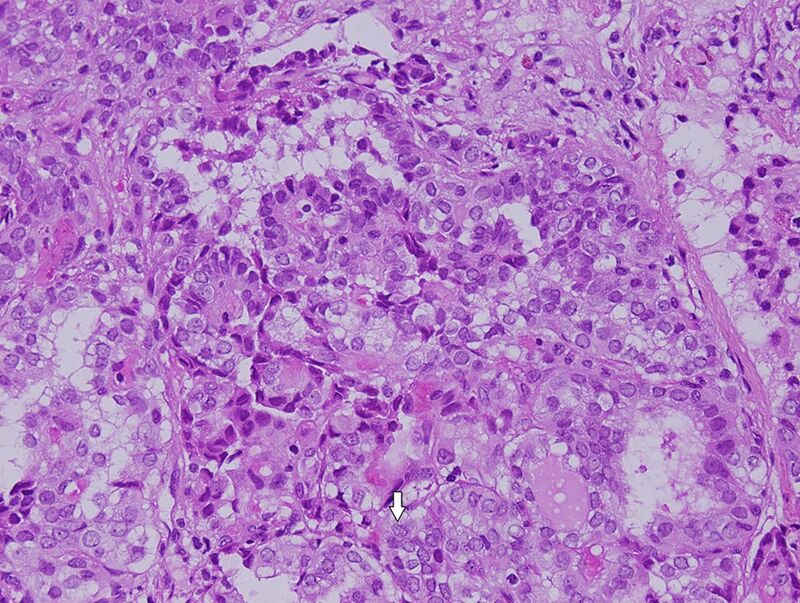 Differentiated thyroid cancer is a rare disease in children and adolescents and manifests exclusively in the form of papillary thyroid cancer (PTC). We present a rare case of PTC who presented initially with lung symptoms and miliary nodules on chest X-ray. This case emphasises the important differential of miliary mottling of the lungs. A 7-year-old girl presented with history of neck swelling and change in voice for the past 9 months and progressively worsening dyspnoea for 5 months. She was assessed elsewhere and treated with multiple courses of antibiotics without relief, as well as levothyroxine 50 µg daily for new hypothyroidism. Her initial thyroid function tests were not available. There was a history of weight loss, but no cough or night sweats. There was no history of tuberculosis (TB) contact or environmental exposure. On examination, child was tachypnoeic, tachycardic and requiring oxygen. Her initial chest X-ray is shown in figure 1. She was initially treated as suspected TB rather than immunodeficiency with antitubercular drugs (rifampicin/isoniazid/pyrazinamide/streptomycin). Bronchoscopy was negative for TB, bacteria, fungus and malignant cells, with lung biopsy (shown in figures 2 and 3). HIV and quantiferon results were negative. Immunohistochemistry of the lung tissue. TSH: 14.7 mill IU/L (0.6–4.1). Free T3: 5.2 pmol/L (4.10–7.90). Free T4: 15.2 pmol/L (11.6–32.8). TPO Ab: >600 IU/mL (normal high ≤34). Thyroglobulin Ab: >4000 (normal high ≤115). 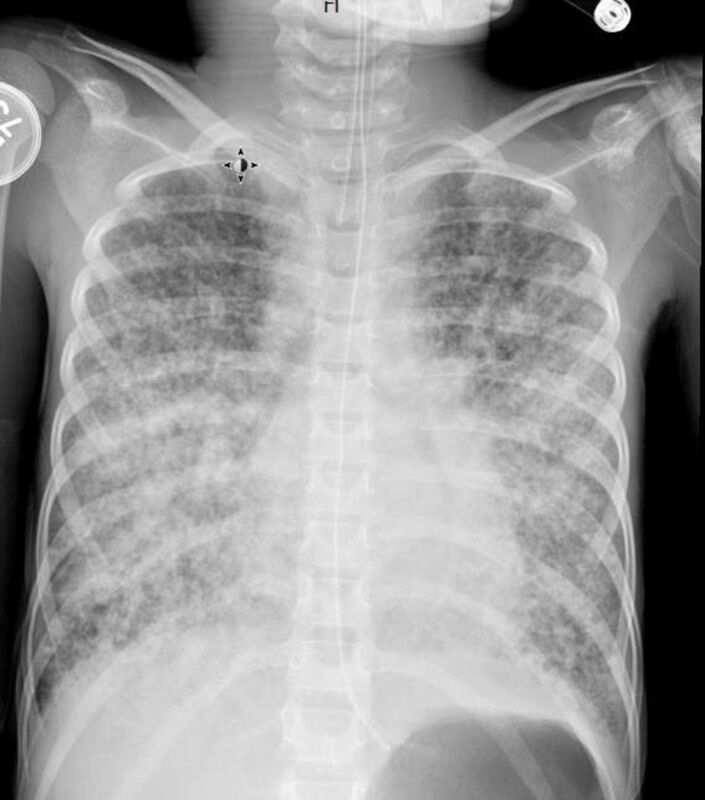 What is the abnormality in the chest X-ray and possible differential diagnosis? What are the histology findings in lung biopsy depicted in light microscopy figure 2 and immunohistochemistry in figure 3? The family asks you: what is the diagnosis and treatment? Are there any side effects? What is the likely outcome? Contributors GK, APSS and RN were involved in management of the patient and reviewing the manuscript. VOS reviewed the pathology slides. KMMM drafted the manuscript. Ethics approval Ethics Committee, Sheikh Khalifa Medical City.